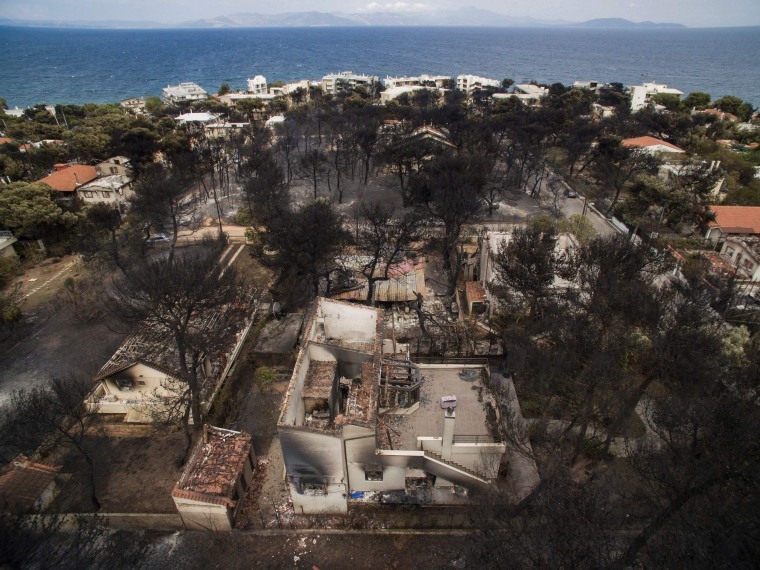 Blazes tore through vacation resorts near Greece's capital during the country's deadliest fire season in more than a decade. Smoke from a wildfire burning outside of Athens, Greece, rises over the Parthenon atop the Acropolis on July 23, 2018. 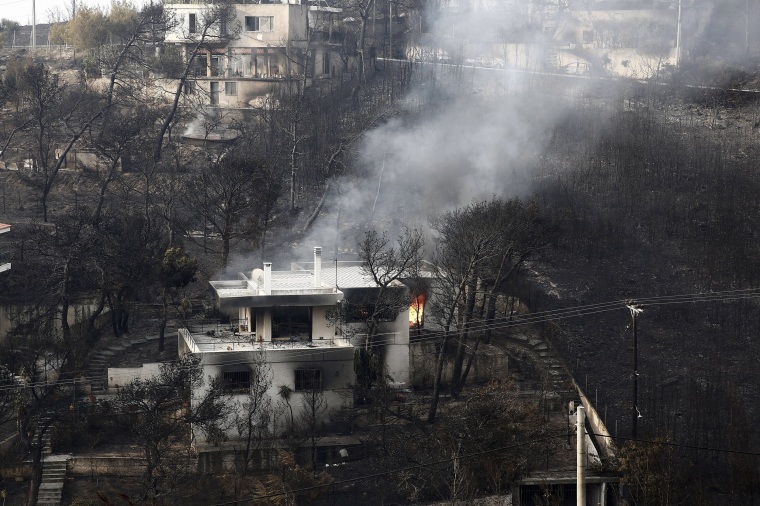 Two large forest fires burned out of control on two sides of Greece's capital, forcing residents to flee to beaches and into the sea, where coast guard boats battled gale-force winds to save them. 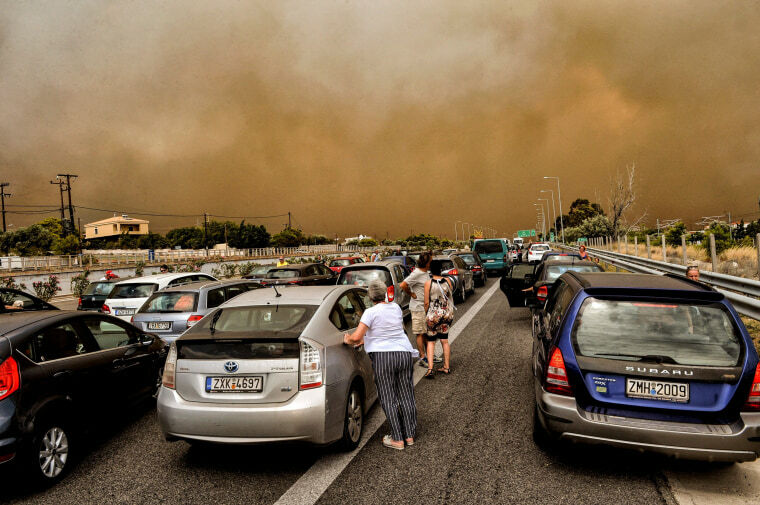 Thick smoke blocks a road in Kineta, near Athens. 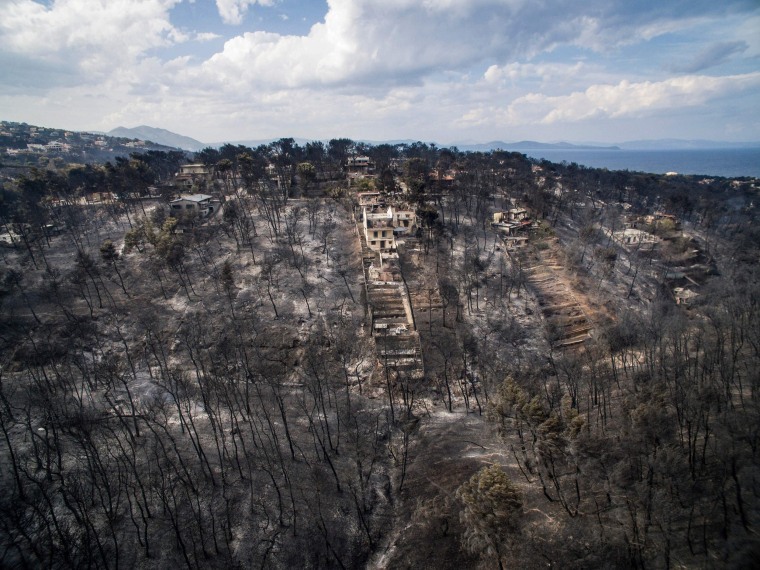 Regional authorities declared a state of emergency in the western and eastern parts of Attica — the greater Athens area — while the Greek government called for the European Union to help them battle the flames. A firefighter moves people away from a burning house in Kineta. 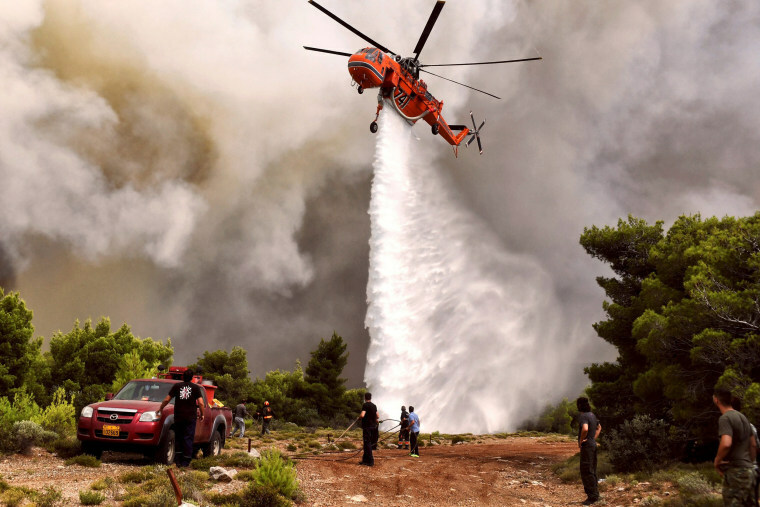 More than 300 firefighters, five aircraft and two helicopters have been mobilized to tackle the "extremely difficult" situation, according to Athens fire chief Achille Tzouvaras. Fire consumes a house in Kineta. The first major blaze erupted in a pine forest near the seaside settlement some 30 miles west of Athens. 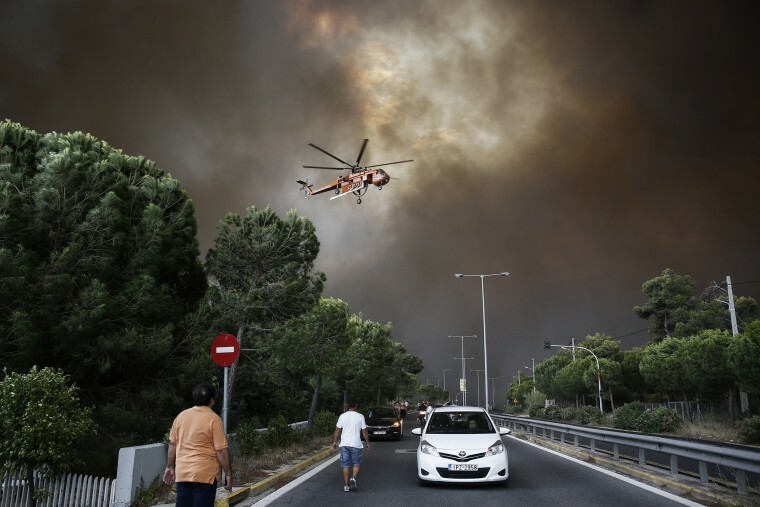 A firefighting helicopter flies over a blaze in the town of Rafina, near Athens. 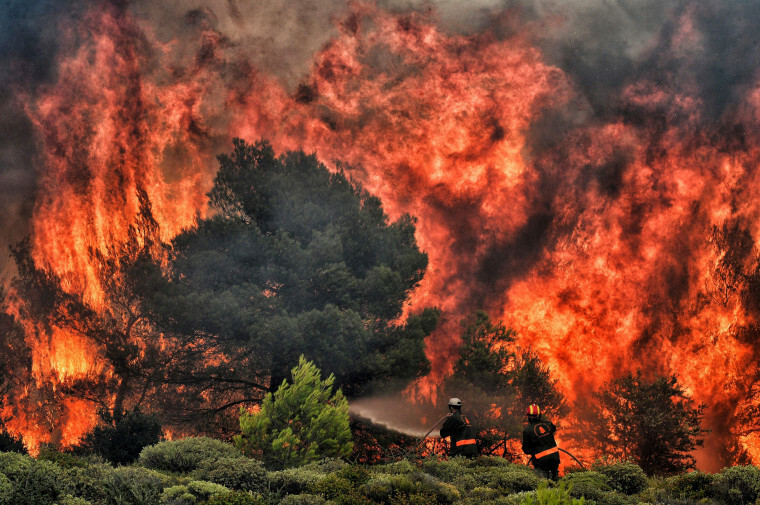 Other fires broke out across the country, including in northeastern Greece and the southern island of Crete, stretching Greece's firefighting capabilities. Gale-force winds that frequently changed direction and continued into the night hampered firefighting efforts. Cars are blocked at the closed National Road due to a wildfire in Kineta. 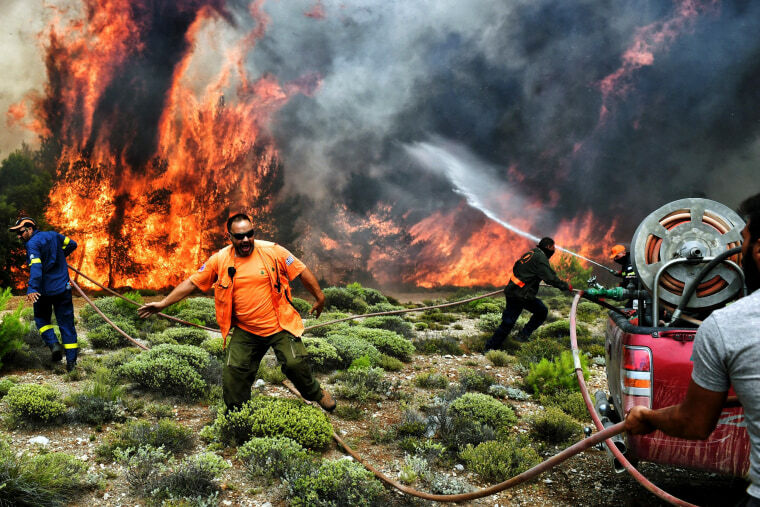 A firefighter douses hotspots in Kineta. A wildfire burns in Kineta. Firefighters, soldiers and local residents carry a hose to a house in Rafina. A firefighter wears a flame-resistant uniform in Rafina. 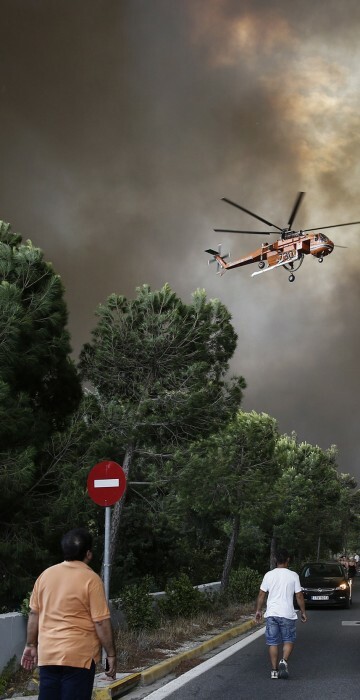 A firefighting helicopter flies overhead in Neo Voutsa, a northeast suburb of Athens. Rescuers and volunteers help locals evacuate the village of Mati. 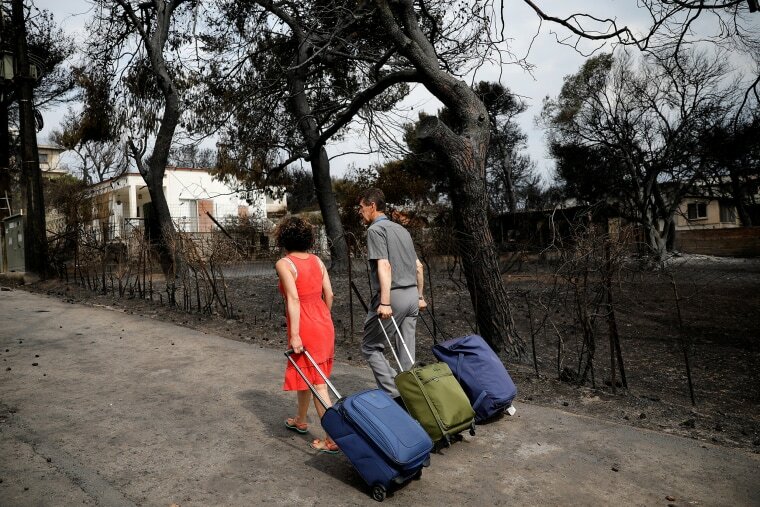 Residents scrambled to the water’s edge as blaze swept through the coastal resort. Hundreds were rescued by passing boats but others found their way blocked by smoke and flames. 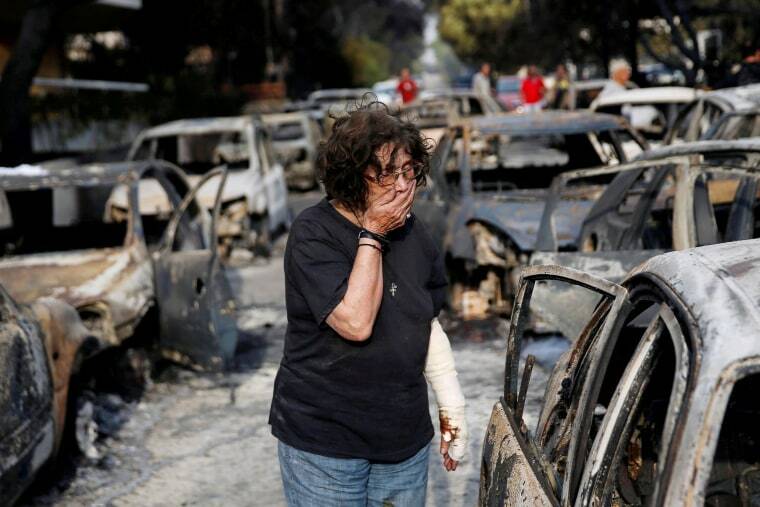 People watch a wildfire burn in Rafina. 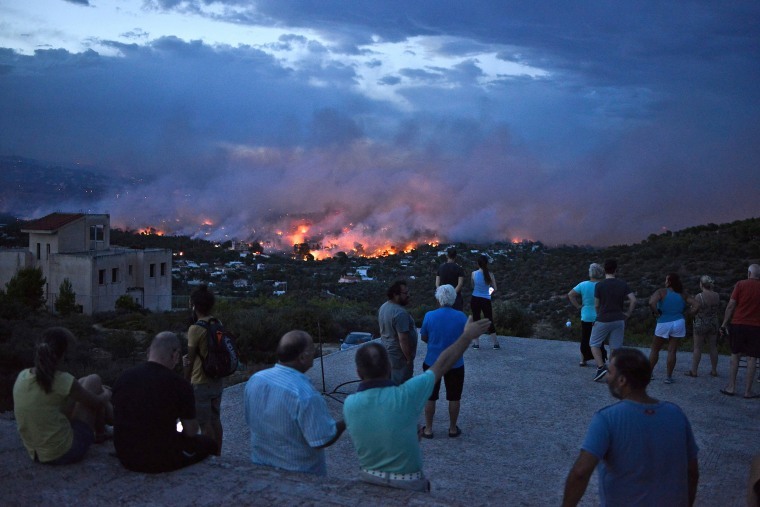 Mayor Vangelis Bournous said he believed about 100 houses in the town had been burned. 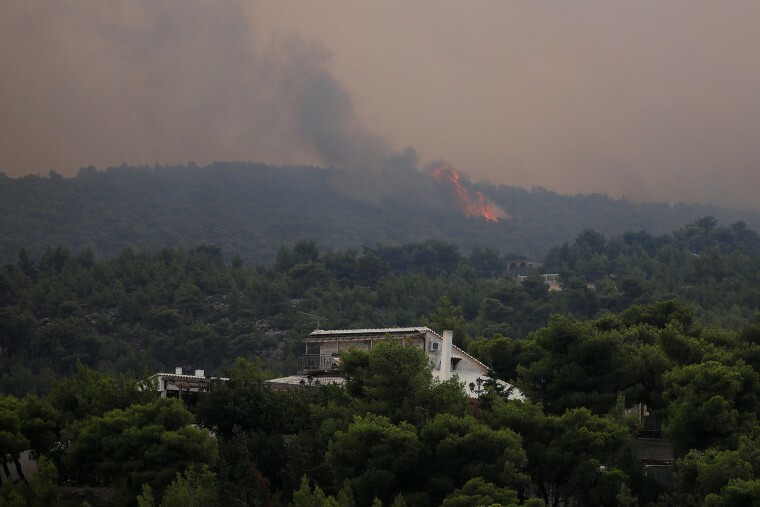 Firefighters, soldiers and local residents battle fires in Rafina. Rescuers wait in the village of Mati after multiple bodies were discovered on July 24. A fire burns inside a house Neo Voutza. Burned cars clog the streets in Argyra Akti, Mati. A local walks on a burnt slope near a destroyed house in Mati. The death toll from the fires soared with a Red Cross official reporting the discovery of 26 bodies in the courtyard of a villa in Mati. A woman tries to find her dog in Mati. Destruction near the village of Mati. 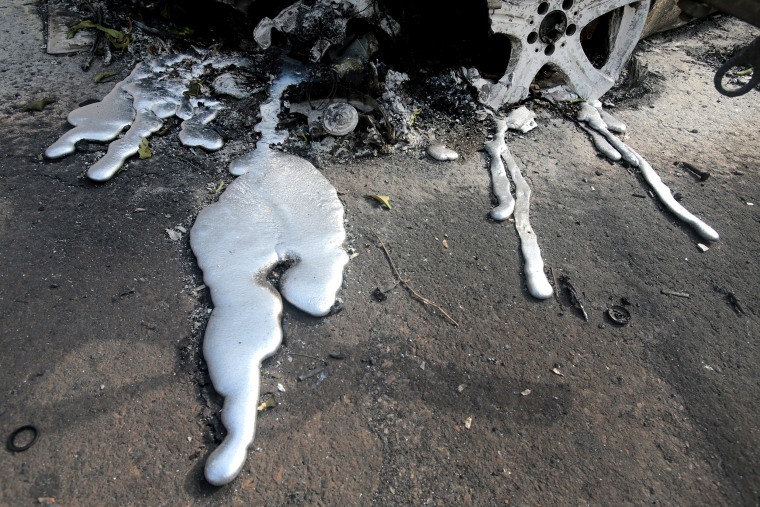 Melted metal from burned cars in Mati. Firefighters and volunteers try to extinguish flames in Kineta. A helicopter drops water in Kineta. Firefighters try to extinguish flames in Kineta. Locals leave Mati on July 24.